A touching documentary on an enduring love is making its way into Korean theaters this month. 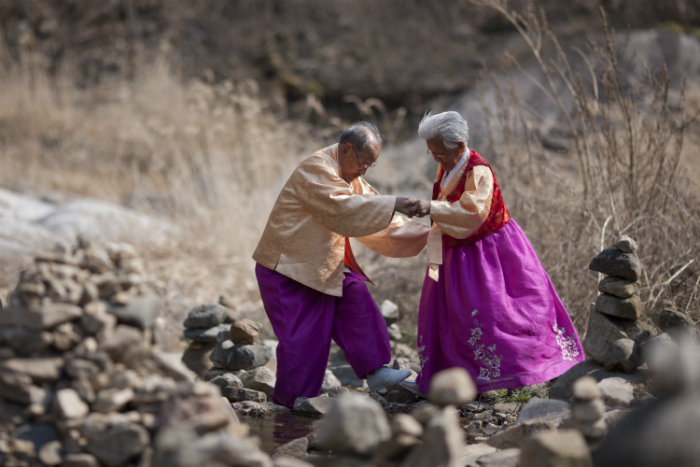 Invited to compete in the official competition section of the DMZ Korean International Documentary Film Festival earlier this year, My Love, Don’t Cross that River follows a couple, JO Byeong-man and KANG Gye-yeol, who have come to be known as the ‘100-year-old lovebirds’. Following 76 years of marriage, an elderly man and woman have lost none of the luster of their love, displayed in a relationship filled with camaraderie, fun and undying devotion. Perpetually clothed in traditional Korean hanboks, the couple still sleep hand in hand yet the end of the road is nigh as their time is running out. My Love, Don’t Cross that River is directed by veteran documentarian JIN Mo-young, who has actively been shooting non-fiction works for Korean broadcasters since 1997. He also produced Shiva, Throw Your Life from last year, which was directed by My Barefoot Friend filmmaker LEE Seong-kyu. JIN’s film captures the tenacity of love across generations.